Hi everyone, I have only just logged on to my laptop after 3 days, it has been a really busy weekend- a good one, just busy!! 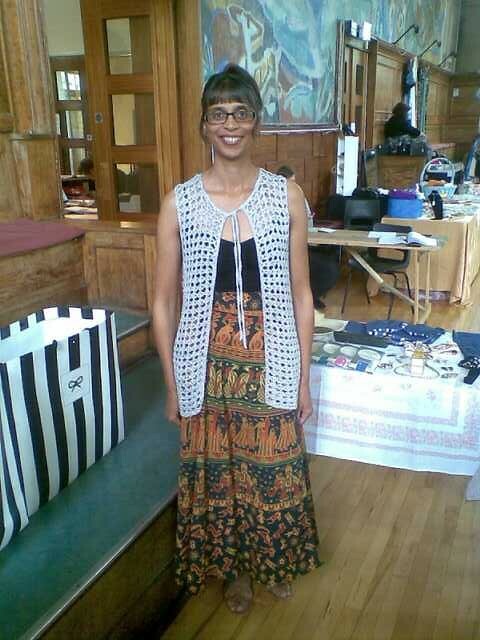 I did a Vintage Fashion Fair on Saturday as well as Sunday, Saturdays one was at Wanstead, East London which I didn't blog about as I was a bit nervous it being my first time there. I didn't need to worry, as it was a lovely atmosphere and had a steady flow of customers and it was great to meet new sellers and also see again my lovely blogger friend at Elegancemaison who also had a stall. Hubby and I had a really nice day, the weather was so hot so I didn't need a cardigan or jacket! Sunday we were at Primrose Hill which was another lovely day out but the weather was really quite cold and then it poured down with rain!! It was back to the day job yesterday and I hit the boot sales and charity shops yesterday and today too, so feel quite knackered!! I'm behind on my blog reading, so I will definitely be checking in with you all over the next few days! The sun has been out today-hurray, I hope it stays for a few days at least! Wishing you all a good week whatever you are upto!! I'm so glad it all went well for you. You look gorgeous in both outfits and your stall looks so inviting. Looks like you had a great time! Your outfits are great, my fav is the sun dress! Perfect! Oooh, love the sundress! I could imagine dancing in that! Glad the fairs went well! Wish I'd known about Wanstead- that would have been relatively easy for me to get to! I love that stripy dress. 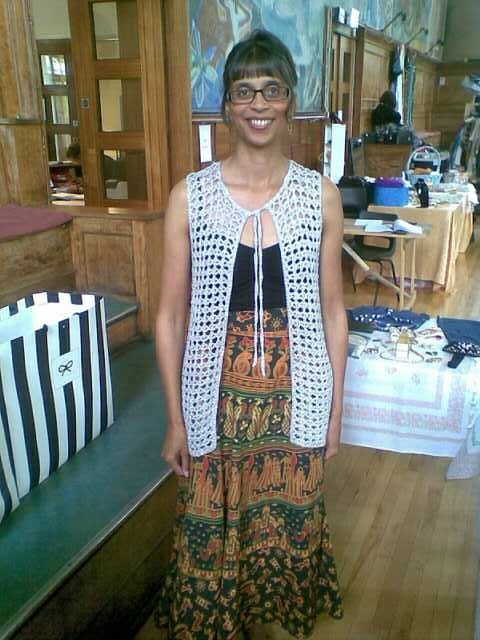 Glad to hear the fairs went well and it looks like you had a great time. Your sun dress is beautiful - the colours are delightful. Glad you had success at the fairs, I really need to give it a go one day. I.m glad that you had fun and that the events went well. Both outfits are so cool but for me the dress is the icing on the cake! 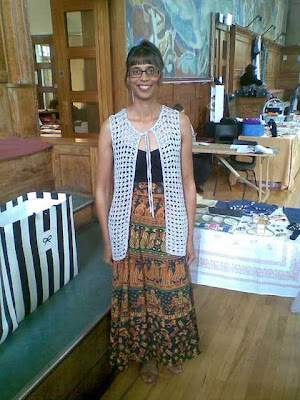 Dear Sharon, the sundress is gorgeous on you! Another great find. Sounds like busy but enjoyable weekend. Hope you made lots of pennies. Great dress. Very on trend. Hope you are managing to catch your breath a little now. I love the striped dress and the crochet vest! 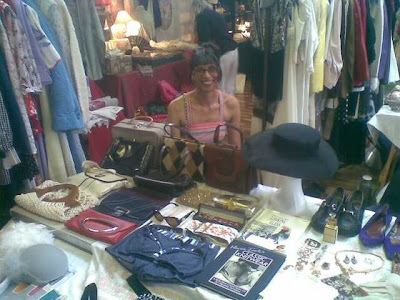 Glad you had a good time at the vintage fashion fairs. Your hubby is wonderful to be going along with you! i love dresses that show off a gal's beautiful shoulders. Gorgeous sundress! Hope the fair went well. You stall looks wonderful - hope to visit it one day! I love the stripey dress! Your stall looks great hon. 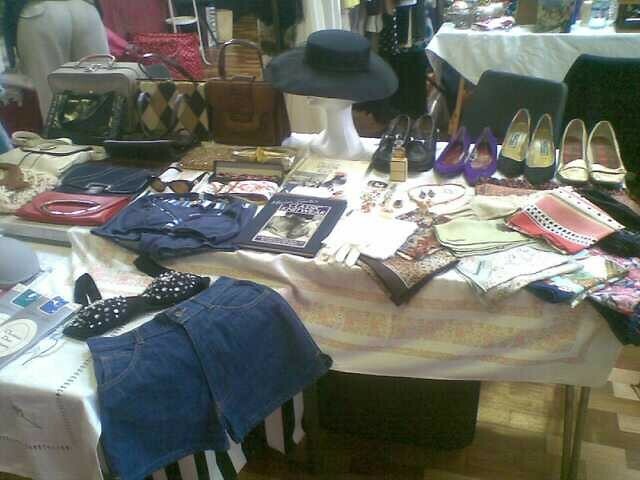 I just love the hubbub of vintage fairs, wonderful atmosphere! Love this dress! And yes, finally...the days when the sun is out seems like a trick day. We need it to STAY, already! Wrangler skirt, but not for me! !